Now that Halloween is behind us, it is time to focus on the next round of big holidays. Between now and New Year’s Eve there will be a flurry of activity in every house across the land. The majority of celebrations involve people coming over to the house to spend time catching up and exchanging presents. That means getting your house in order is a number one priority. The best partner for this goal is Junk King Cleveland. These are the junk hauling experts who can clear you house of all kinds of rubbish in the blink of an eye. Junk King likes to move fast. On any given day, the crews could have up to five to six pick up sessions. Sometimes that means filling up the entire truck, dropping everything back at depot and heading out again. All that before lunch! They’ll ask for a two-hour window for your junk removal session. It hardly ever takes two hours to load up all the things you want to get rid of. Only on those bigger jobs, like a hoarder clean up, would it take longer. The first thing the crew needs to do when they arrive is asses the amount of junk you’re throwing out. They don’t care about the weight or the size. They’re only focused on how they’ll fit all that stuff onto the back of their truck. That is how you’ll be charge. The less room they take up, the less you’ll be paying. That is true if you’re tossing out old sofa or construction waste. After looking everything over, they’ll provide you with a written estimate. This you can lock down. The only time it changes is if your stuff takes up less room than the estimate. That means you’ll pay less. If you go over the estimate, then you’ll still pay that original price. Shop around and you’re sure to see Junk King Cleveland offers the fairest price in town for this type of work. Once all that unwanted clutter is gone, you can focus on decorating the house and getting it ready for visitors. Junk King Cleveland has the perfect work crew to help get your home ready for the holidays. 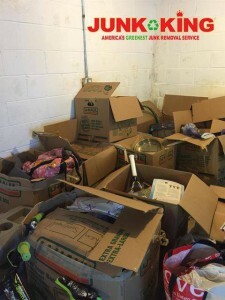 This entry was posted in Cleveland Junk Removal and tagged holidays, Junk King, junk removal on October 31, 2017 by Junk King. Last updated October 31, 2017 .